Ready to take your pound cake recipe from plain to phenomenal? You’re going to love what I’ve done with this one! I think I even surprised myself! A little background: This winter we decided to take skiing to another level. Instead of skiing once a week, we decided to rent a ski house and ski all weekend, every weekend. We really enjoy this, as we get to embrace winter and exercise while having fun as a family. Besides, my best friend joins us for the fun each Saturday. As soon as we finish skiing, both families head to the ski house looking for something to eat. Skiing makes you hungry! I always make sure to have a snack for this starving crowd. One of their favorite snacks is pound cake and hot chocolate. Who can resist a good pound cake? But eating a bare pound cake week after week can get boring, so I decided to ice it with one of my favorite ingredients: cream cheese and Mango Chutney. Get it, “ice it up,” because it’s icing! I tried the combination of Mango Chutney and Cheese in December and it was delicious. I also tried it in a Brie recipe and again: delicious. So I decided to try this combination a my pound cake recipe! Bake the pound cake as the directions on my recipe. I loved the mix of sweet Mango and the Cream cheese. It added a delicious flavor to the icing. It also adds moistness to the pound cake, which makes it melt even further into the mouth. Looking for more delicious ways to incorporate Pataks into your recipe? Check out the Pataks Canada website or their gorgeous Tumblr, Good Korma. This month, they’re featuring plenty of sweet Indian-inspired dishes to finally put an end to the stereotype that all Indian cuisine is spicy! Follow them on Facebook and Twitter to keep up with all their exciting news! I am part of the Patak’s Canada ambassador program and I receive special perks as part of my affiliation with this group. The opinions on this blog are my own. You had me at the words “pound cake” Definitely looks yummy! Pound cake maker/baker here; love Pound cake and will have to try this icing on one of mine. This sounds so good – a little different from the traditional pound cake which I like. The Pound cake looks so yummy & delicious with those Cream cheese icing. The combination of Mango Chutney is something new which I would love to give a try. The pictures are so inviting, thanks for the recipe. Pound cakes are my favorite – like seriously, haha! They are the most delicious things ever. what a unique combination – never would have though of it – I would love to sample though!! Mmmm this looks super tasty. I love baking with cream cheese so I am sure this pound cake is a hit. Oh this not only sounds but looks delicious. 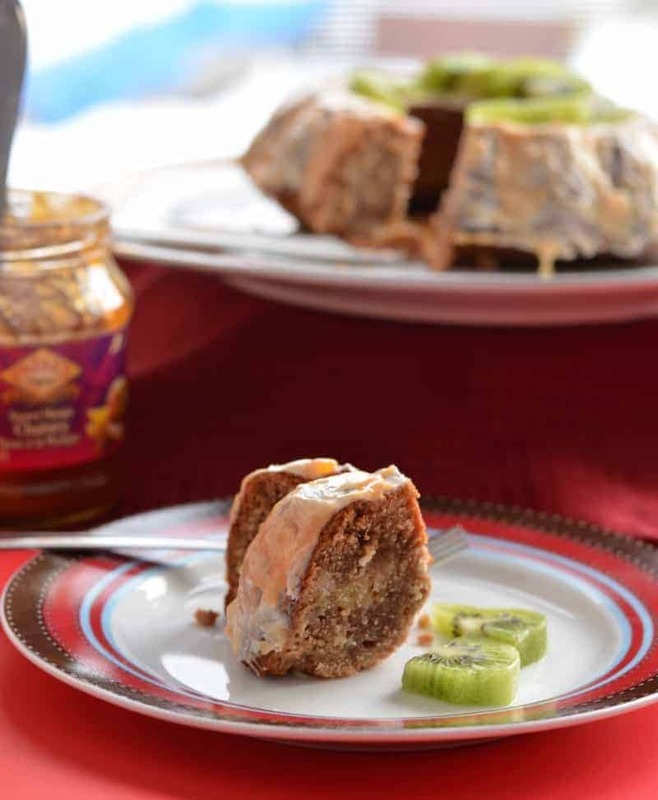 I just love mango chutney and have never tried it on a cake before. This sounds moist & sweet, just how I like my cakes! Mango is one of my faves, too! That certainly is taking your pound cake beyond plain. How awesome does that look. It is a recipe I need to try. Ooooh now this is something different I would love to try! It sounds really great! A nice slice of pound cake sounds amazing right now, this recipe sounds so good! Sounds like a great recipe. I like how you added the kiwi on top – my son’s favorite! That pound cake looks great. Mango chutney sounds like it would be so flavorful! This sounds so delicious. I love pound cakes but never made one with mango chutney. I love pound cake and I think I might like this. I would have to try it first but I like mango chutney so I’m thinking I will. That looks very good. I may have to try this one out for something different. I want a piece now. Wow, and such a unique recipe! I have never heard of Chutney. 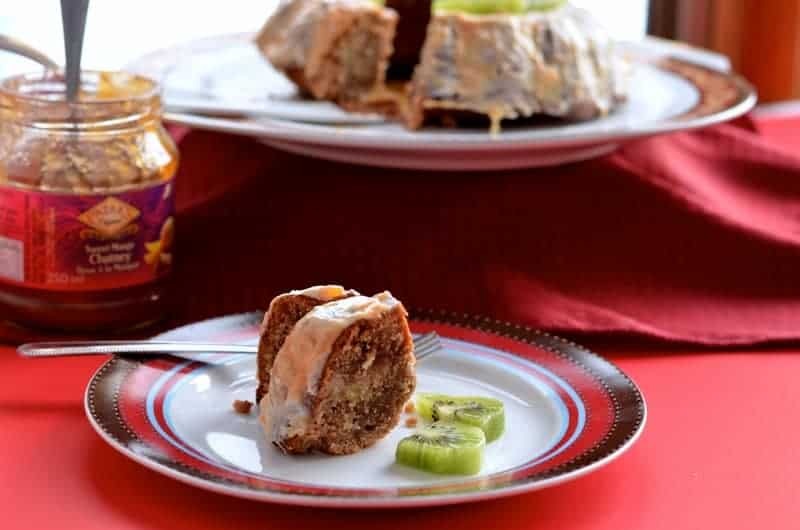 This cake looks great and we love mango but what is chutney. That sounds SO good. I would absolutely LOVE to try this.